Samsung brings e-ink to the Alias 2 messaging phone. This tricked-out keyboard does a lot, but did they pay enough attention to other features? 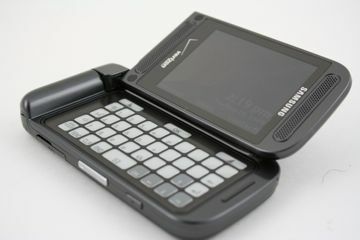 The Samsung U750 Alias 2 is the company's second shot at the dual-hinged messaging phone. The U750 surpasses the original in many ways, especially with its new e-ink keypad. For the SMS/MMS and IM junkie, the U750 offers a quick fix. Those seeking more robust features, however, will notice some glaring omissions. Today Samsung and Verizon Wireless announced the Alias 2. The Alias 2 (U750) is a second take on the original messaging phone that brings with it a major revision to the QWERTY keyboard. Verizon Wireless today announced the Samsung Zeal, a follow-up device to the Alias 2. Similar to the Alias 2, the Zeal has a dual-hinge design that allows it to open as both a normal clamshell phone and a sideways clamshell phone. E Ink today announced Advanced Color ePaper (ACeP), which is a full-color reflective display. E Ink says this is the first time an electrophoretic display can produce color in every pixel without the use of a color filter array. Google today took steps to simplify its mobile and online payment products by combining them into a single service called Google Pay. Moving forward, Google Pay will encompass the features of Google Wallet and Android Pay. Does anyone know if the 1300ma extended life battery (and cover) from an "original" Alias will fit the Alias 2? How easy is this to be pressed when in your pocket or purse? taking a picture or making a call isn't too bad but I don't think I would like it if I kept turning my phone off.